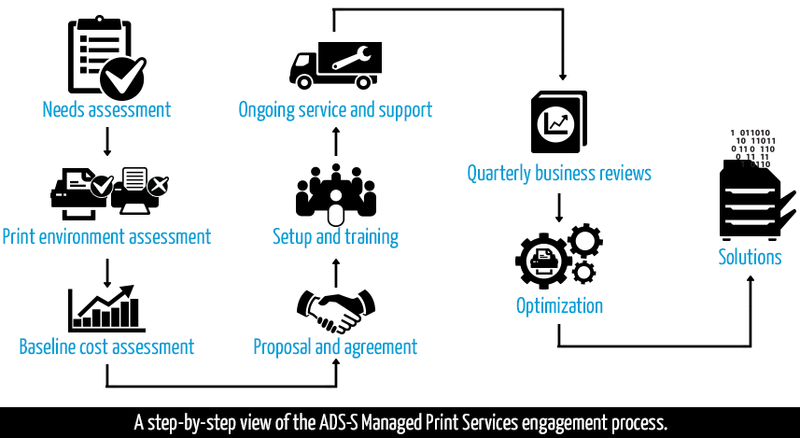 When you hear the term “Managed Print Service” or MPS, does the image of a large printer press come to mind? Are you thinking about letterhead, business cards and brochures? Don’t worry, it’s a common misconception, so let’s clearly define what MPS is and how a Managed Print Services environment can improve your office’s everyday printing, copying and faxing tasks. MPS is all about what and how your office prints on the printers that reside in your office(s). To make it simple, MPS is all about getting your arms around your office’s entire printer fleet, providing tools to monitor and manage your devices, deliver supplies and offer optional on-site service to keep your devices up and running. Ads-s offers all this and more while still producing a significant savings to your organization. As print, copier and fax devices become more expensive, complex (more moving parts for automatic document feeding, duplexing, finishing) and handle higher volumes-organizing financing, help desk support, hardware and supplies into a single contract makes sense. But, to fully benefit from MPS, a company should have a comprehensive analysis with an emphasis on helping them spend less, not purchase more. At ads-s, we work with you to make sure your current devices are in the right place for the right application at the right volume.